Our fast-paced, ever changing world demands flexibility. What worked perfectly well yesterday, no longer meets our requirements today. 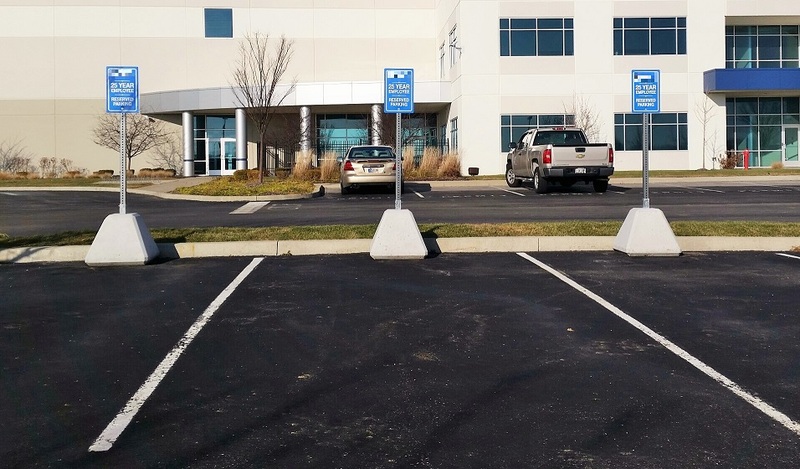 When a manufacturing facility in Noblesville, IN wanted to recognize long time employees with special signage in their parking lot they called on Indiana Barrier Company. The facility had signs and sign posts on-site recognizing these employees who had spent 20 or more years with the company. They needed bases which would be sturdy enough to stay in its designated parking spot, but easy to moved out of the way for snow removal or other parking lot maintenance. Over time, they will also need to replace some of the signs as employees leave the company, or new ones achieve the 20 year mark. We produced and delivered 35 concrete sign bases for the project. The heavy weight of the base ensures the sign won’t tip over. Typically, our sign bases include a 7.5’x2” square steel sign post with a pyramid cap. This project did not demand the typical protocol, instead they fitted their existing sign posts into our concrete bases. Today, these signs honor employees who have dedicated 20 or more years to the company. They enjoy the finest of parking spots in appreciation for their hard job over the years. It was heartwarming to see that in our fast-paced society some things remain constant. In this case, those dedicated individuals had a visual daily reminder of their hard work (plus, a nice parking spot)! Need a few flexible pieces for your parking lot? Check out our products page to see what we can do for you.